Note: by clicking this symbol you return to the top of the page. This page does not cover the 8 statues which were added in the XIXth century to replace statues damaged by floods or war events. 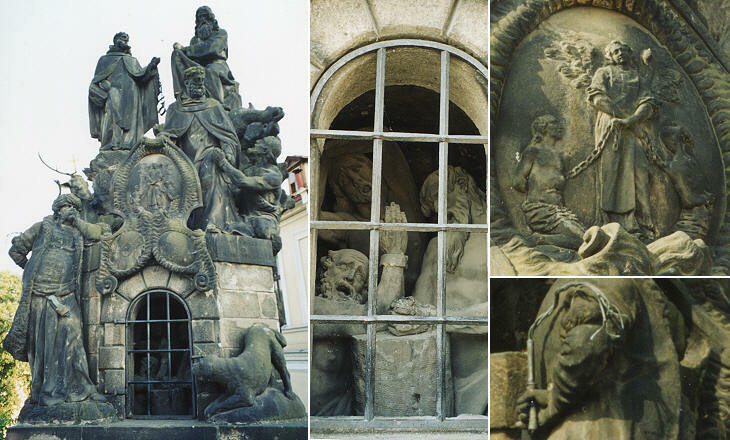 The statues are numbered starting from those next to Mostecka Vez. Johann Brokoff (1652-1718): statue of St. John Nepomuk (16): it was the first statue (1683) to be put on the bridge at its center. 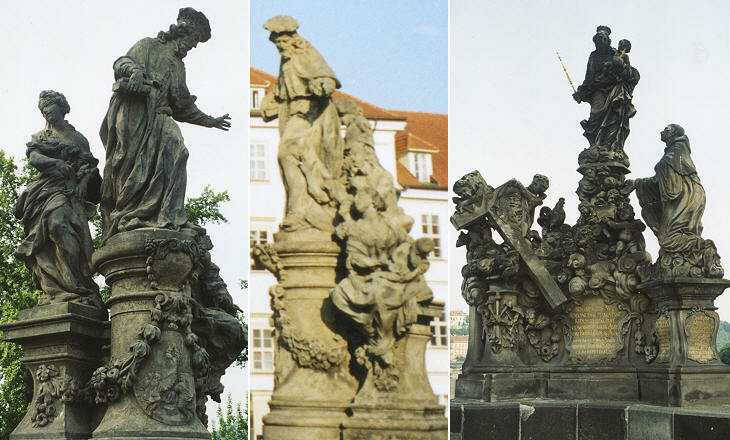 Johann Ulrich Mayer (?-1721); statues: (18) St. Anthony (1707); (20) St. Jude of Thaddaeus (1708); (30) St. Cosma and St. Damiano (1709). Matthias Wenzel Jackel (1655-1738); statues: (2) The Virgin with St. Bernard (1709); (4) The Virgin with St. Dominic and St. Thomas Aquinas (1708); (8) St. Anne (1707). Michael Bernhard Mandl (1660-1711); statue (26) of St. Philip Benizzi (1711). 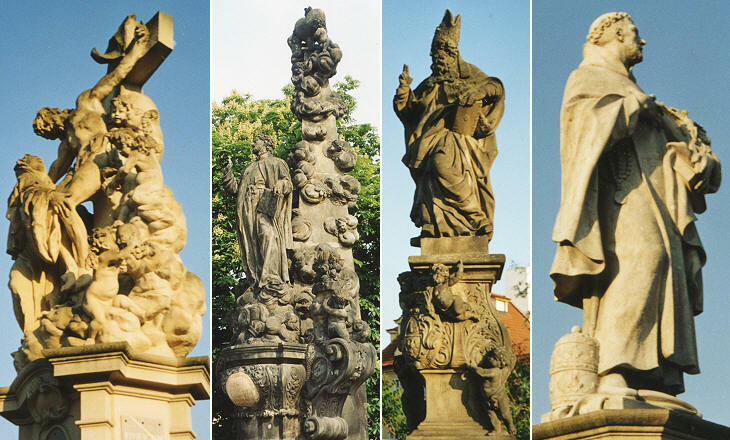 Johann Friedrich Kohl (1681-1738); statues: (21) St. Nicholas of Tolentino (1708); (22) St. Augustine (1708). 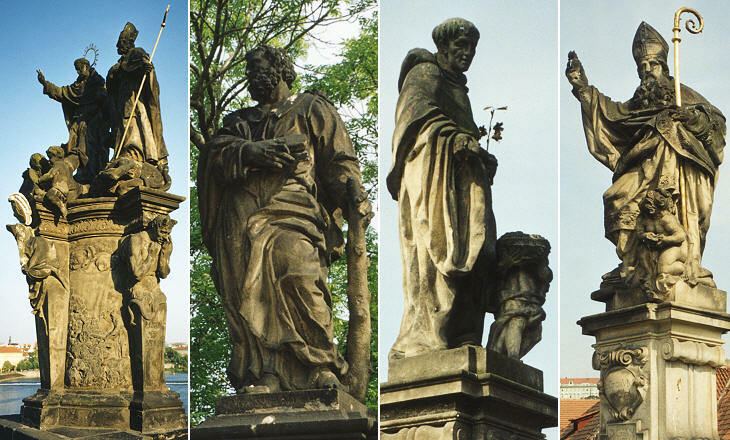 Matthias Bernard Braun (1684 - 1738); statues: (1) St. Yves (1711); (15) St. Ludmilla (1720); (23) St. Luthgard (1710). Michael Johann Josef Brokoff (first son of Johann Brokoff) (1686 - 1721); statue (25) of St. Adalbert (1709). Ferdinand Maximilian Brokoff (second son of Johann Brokoff) (1688 - 1731); statues: (3) Saints Barbara, Margaret and Elizabeth (1707); (9) St. Francis Xavier (1711); (13) St. Francis Borgia (1710); (19) St. Vincent Ferrer and St. Procopius (1712); (24) St. Cajetan (1709); (27) Saints John of Matha, Felix of Valois and Ivo (1714); (28) St. Vitus (1714). St. Yves: an Augustinian, he lived in the XIth century in France. He played a prominent role in the investiture dispute advocating a policy of moderation for both sides and wrote widely on canon law. He is the patron of the lawyers. The church inside the University of Rome is dedicated to him (S. Ivo alla Sapienza). Statue (1) (1711) by Matthias Bernard Braun. St. Francis Borgia: at the death of his beloved wife, Francis gave up his Dukedom in Spain and became a Jesuit priest. He preached in Spain and in Portugal and he became Superior General of the Jesuits. Under his guidance, the Jesuits grew to great importance in many lands. Statue (13) (1710) by Ferdinand Maximilian Brokoff. 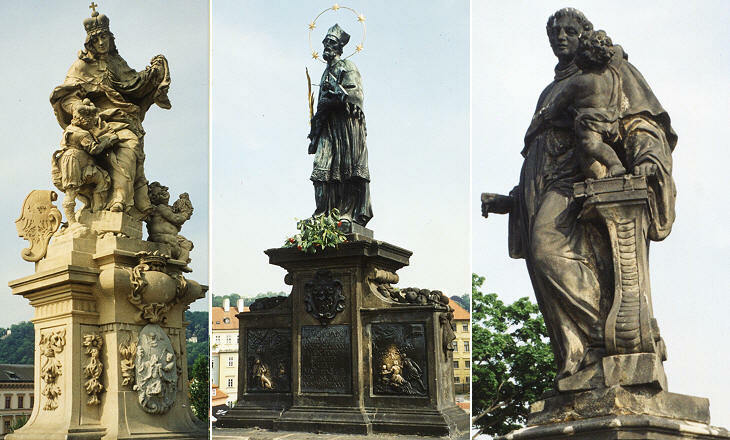 St. John (of) Nepomuk: he is the most popular saint in Prague. He is usually shown holding a crucifix. He was thrown in the river on May 16, 1383 by King Wenceslaus IV of Bohemia: according to the acts of the canonization he had refused to betray the confession of the queen. He became a saint in 1729 in the frame of the efforts to re-catholicize Bohemia. Statue (16) (1683) by Johann Brokoff. St. Vincent Ferrer: he was born in Spain and became a Dominican in 1374. He became the adviser of Cardinal Pedro de Luna in Avignon. In this capacity St. Vincent made unsuccessful efforts to put an end to the great schism. He was appointed apostolical missionary and he preached in many European countries. Though the Church was then divided by the great schism, he was honorably received in the districts subject to the two claimants to the Papacy. He lived to see the end of the great schism and the election of Pope Martin V in 1415. Statue (19) by Ferdinand Maximilian Brokoff (1712). St. Nicholas of Tolentino: born in 1245 in Italy he became a priest at 25. He gained a reputation as a preacher and a confessor. Eugene IV canonized him in 1446. See the church dedicated to him in Rome. Statue (21) (1708) by Johann Friedrich Kohl. St. Luthgard: she is one of the outstanding mystics of the Middle Ages. A vision of Christ compelled Luthgard to become a Benedictine. She had many mystical experiences, levitated, and had a form of the stigmata. She lived in the XIIIth century. Statue (23) by Matthias Bernard Braun (1710). St. Cajetan: a member of the Oratory of the Divine Love, he founded a new order (the Theatines). He lived in the first half of the XVIth century. Statue (24) (1709) by Ferdinand Maximilian Brokoff. St. Adalbert of Prague: he took the name of his catechist when he was baptized. He became the second bishop of Prague, the first to have been born in Bohemia. Adalbert was canonized in 999. Statue (25) (1709) by Michael Johann Josef Brokoff. St. Philip Benizzi: Servite cardinal and preacher. Born in Florence, Italy, in 1253 he joined the Servite Order. He served as a lay brother until 1259, when his superiors directed him to be ordained. Philip soon became known as one of the foremost preachers of his time. He was named as a possible candidate to become pope by the influential Cardinal Ottobuoni just before the election to choose a successor to Pope Clement IV. This possibility was so distressing to Philip that he fled and hid in a cave until the election was finally over. He was canonized in 1671. Statue (26) (1711) by Michael Bernhard Mandl. See also the relief by Antonio Raggi in the church of S. Marcello in Rome. St. John of Matha and St. Felix of Valois: John lived as a hermit for a time before being ordained in Paris in 1197. He joined St. Felix of Valois in his hermitage and he confided to Felix his idea of founding a religious order to ransom Christian prisoners from the Moslems, and late in 1197, the two went to Rome and received the approval of Pope Innocent III for the Order of the Most Holy Trinity (the Trinitarians). The Order flourished, spread to France, Spain, Italy, and England, sent many of its members to North Africa, and redeemed many captives. Statue (27) (1714) by Ferdinand Maximilian Brokoff. St. Yves, patron of the lawyers, is accompanied by an allegory of Justice, shown as a blindfolded young woman and he turns his head towards an allegory of Charity. It is one of the best statues on the bridge. The group of the Virgin with St. Bernard shows how the sandstone used for most of the statues has been affected by pollution. 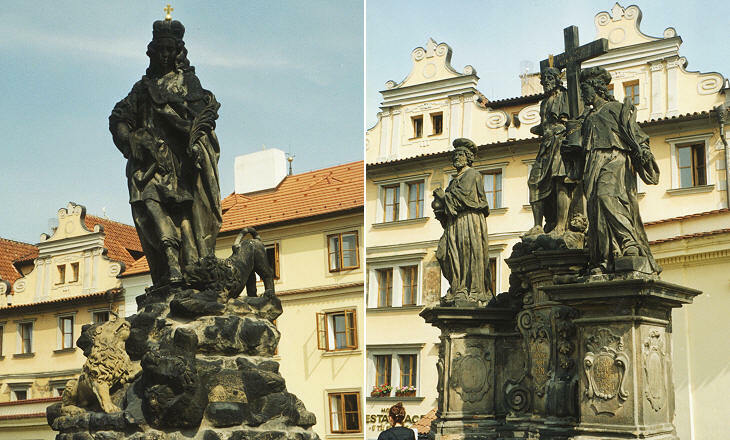 A cross was erected at the beginning of the XVIIth century and the Jewish community of Prague had to pay for it. The statue was added in the XIXth century. The statue of St. Francis Xavier inspired Josef and Emanuel Max to create a gigantic Monument to Marshal Radetzky, which stood from 1858-1919 in the main square of Mala Strana in Prague. Marshal Radetzky defeated the Piedmontese troops and the Italian patriots in 1848-49. The statue was seen as a symbol of the Austrian Empire and it was moved in 1919 to a museum. The statue of St. Francis Borgia is accompanied by two very fine baroque angels. 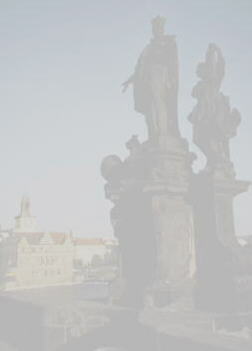 The statue of St. John Nepomuk is on the middle of the bridge, at the point from which he was thrown into the river. The reliefs below the statue (the only one which is cast in bronze) shine because touching them brings good luck. 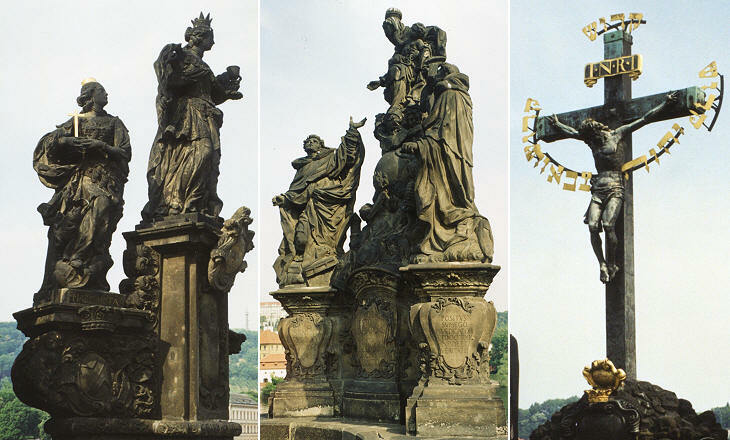 The statues, with the exception of St. John Nepomuk, were put on the bridge in the period 1707-14. The first statues in general showed just the saint. St. Jude of Thaddaeus is the only saint of the ancient world. The Jesuits who master-minded the plan for the decoration of the bridge, thought that saints linked to the national traditions or to the Counter Reformation period, were more suited to their efforts to re-catholicize Bohemia, than let's say the twelve Apostles. The Vision of St. Luthgard was the first work of Matthias Braun in Prague and it ensured him admiration and a lot of orders, which he could not manage alone. He just created the designs and finished the work done by his assistants. St. Luthgard is shown while she has the vision of Christ. The most complex statue of the bridge is dedicated to the Trinitarians, an order devoted to ransoming Christian prisoners from the Moslems. This was an issue also in Bohemia, because in 1683 the Turks had laid siege to Vienna and although they had been defeated by the arrival of the Polish army, they still occupied most of Hungary and their raids into the neighbouring countries were a real threat. St. Cosma and St. Damiano had been physicians and they became famous for their miraculous cures and converted many unbelievers to Christianity. 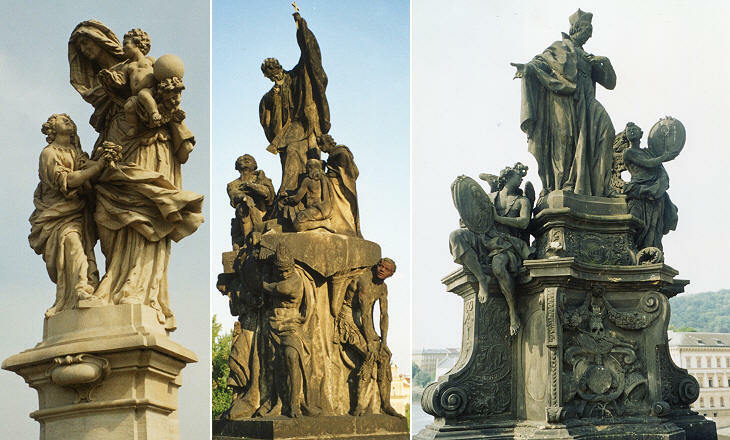 The statue by Johann Ulrich Mayer is the last sculpture on the bridge and it was erected by the Prague Medical Faculty. In accordance with tradition, both doctors are represented in scholars' robes and healing the sick. Move back to part one: The Bridge.